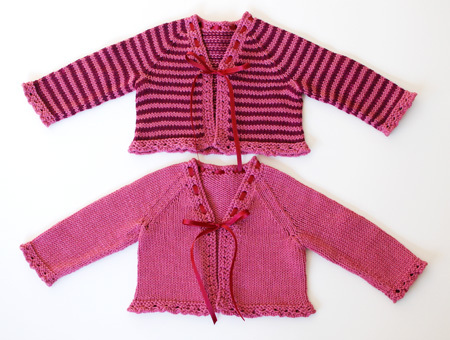 I know I caused all kinds of confusion when I showed you two little balls of Rowan Cotton Glace, one pink and one burgundy, and then a finished sweater that was all pink. Well, I knit two of them! Pattern: Babies who lunch cardigan from The Little Sublime Hand Knit Book, in the smallest size, 0-3 months. I made a bunch of simple modifications to this pattern. I knit the fronts and back in one piece up to the armholes, and I knit the yoke continuously, too, instead of seaming the raglan seams. However, I knit the sleeves flat – first, it allowed me to nicely match up the stripes for the striped sweater, à la Budgie (no color jog), and second, I just don’t like knitting sleeves in the round. Yarn: The wonderful Rowan Cotton Glace, 100% mercerized cotton, in colors 724 (pink) and 805 (burgundy). I machine washed these sweaters without any ill effects, and though I laid them flat to dry this time around, I have a feeling this hardy cotton would do just as well if tumble-dried. As I mentioned, I used only 2 balls (2 balls!) to knit each sweater. Well, to be honest, the striped version used a little bit of the pink yarn left over from the solid version, because those ruffled edges sure eat up a lot of yarn. So, 4 balls total for the 2 sweaters :). I think the reason I was able to get away with so little yarn is because this sweater is cropped (about 8.5″ hem to shoulder) and has a fairly open neckline. Any other design would surely require more. Needles: I think I used US 3 and US 5 circs. Extras: The ribbon is super simple satin ribbon I picked up at Windsor Button. The ends are sealed with a drop of Fray Check . I’ll be the first to admit that this ribbon wasn’t exactly my first choice in terms of color, but the selection was limited and it’s elementary to switch out, since it’s not tacked to the sweaters in any way. I think teal (just the right shade of teal) would look super, but I just didn’t find it at the time. 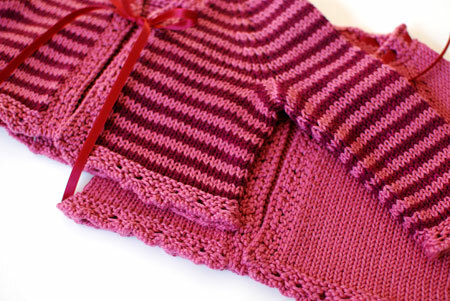 The little sweaters have already reached their destination – twin girls who should be arriving some time in March. Can’t wait to see the little cuties! What a precious gift! I think that’s the ‘Sunday Best Cardigan’ though, not ‘Babies Who Lunch’. At least I couldn’t find one named that on the link you had. Whatever it’s called, I LOVE IT! They are both gorgeous little sweaters. 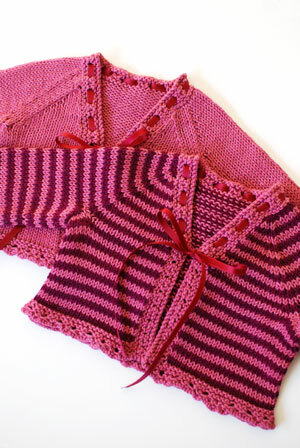 I love the stripey combination – can never resist stripes on baby sweaters! Awesome. I swear the biggest reason baby sweaters are so popular is that they are that beautiful intersection between interesting projects and allowing us with the single skein (or slightly more) habit to make something other than a scarf or a tiny accessory with our yarny purchases. It’s great that there are any sweaters that are just two skeins of yarn! Ooh! I have two balls of Cotton Glace kicking around. I think I might have to try this one! You are so talented! Those are absolutely adorable – will have to add this to my list of baby sweaters to try when someone has another little one!